Special Event: Rise for Days of the Frozen Throne! The Lich King is back with his various shenanigans and will be hosting next week's Tavern Brawl and more! Featuring the Death Knight heroes and KotFC cards, you'll also be getting a free golden card if you log in from September 19th to the 23rd! There's also 600 gold to be won in 2 special quests and a new bundle with 30 KotFC packs! I, the Lich King will soon return to your pathetic world, mortal whelps! I left some belongings at Blizzard Headquarters during my last visit. While I’m in town to pick them up--from September 19 through September 23--you are invited to resurrect the glory of the Knights of the Frozen Throne. . . But better! If Knights of the Frozen Throne boggled your mortal minds, brace yourself for: DAYS of the Frozen Throne. 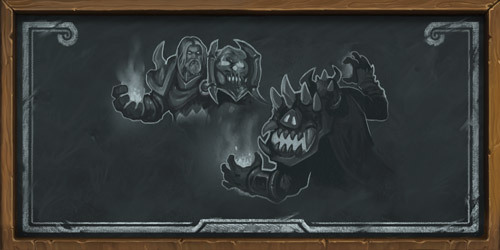 Next week, I will once again raise Hearthstone’s champions as Death Knights in a brutal new Tavern Brawl! I will also dispose of some gold I don’t want to carry back to Northrend. And if you’re looking for more undead muscle, you can recruit more of my minions to do your bidding for a cool price. Prove which of my Death Knights reigns supreme in this chilling Tavern Brawl! You and your opponent will both skip tedious mortality and begin the match as a Death Knight! Each deck also comes appropriately armed with Knights of the Frozen Throne cards. Log in to Hearthstone during the Days of the Frozen Throne to receive a free golden Happy Ghoul card. Unleash its cuteness on your future opponents. Or disenchant it, like an ungrateful savage. Complete sequential special quests in order that reward 300 gold each, for a total of 600 gold. My total lack of interest in financial planning is your windfall! Is your frail living body prone to cold? Want more cards from the Hearthstone expansion featuring the most powerful being to have ever un-lived? Do you crave the ferocious might of more Death Knights for your collection? Then acquire the Bundle Up Bundle – 30 Knights of the Frozen Throne card packs for a special price! I tire of this prattle. Attend and be rewarded, mortals! 30 packs for Frozen Throne - I could use those. I am missing tons of important legendaries. I'll buy it if the special price is 5€. Which it won't be, but you can hope, can't you?